I really love problem solving. I’m actually passionate about it and always have been. I am repelled by anyone who just wallows in negativity, unwilling to tackle problems with a solution-oriented approach to them. Yet I do understand that problems can seem insurmountable at times and overwhelm the best of us. One thing that keeps me grounded in my rather odd, problem-solving approach to life is understanding that it’s easier to have a problem-solving posture to life’s challenges when you are standing on the outside of those problems, looking in. One of the great advantages I’ve had as a fundraising consultant comes from knowing that when called in to help others solve problems, I didn’t create the problem, I am not personally absorbed with the problem, and I may or may not be able to solve the problem. This keeps me detached and thinking creatively; but it also keeps me humble. When you understand that, even if an expert, you have limitations, then arrogance is just not an option. The position of standing outside of a problem, looking in at it, is very different from being right in the middle of it, and I know this. The stress and anxiety of being in the very center of a problem can be blinding and keep any of us from accessing all of our resources. 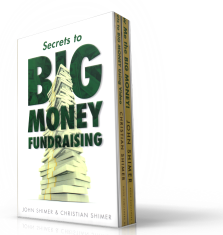 In the fundraising arena, I have years of experience in solving a specific type of problem. My expertise is a special toolkit for helping solve fundraising problems, but getting my clients to use the tools I give them can be a challenge at times. Since fundraising is so counter-intuitive, many of my clients can’t see things the way I see them. This is another reason for me to remain humble. I absolutely can’t succeed in helping clients who won’t embrace the advice I give them. Unless my client and I get on the same page, nothing good is going to happen. No problem will get solved. For ideas to have their greatest appeal and power for change, they must at least feel as though they are ideas that came from within us. Ideas from within are the ones we are proud of. Those are ideas we own, and those are ideas we are willing to pursue with passion and even with sacrifice. Time and again, I have been called in to consult on a project and have been presented by leaders in authority with a brilliant need definition. They proceeded to spell out an even more brilliant solution. But then, they tell me that no one seems interested in helping implement the solution! They are shocked. They are mystified! “What are we doing wrong?” They insist on declaring their pure intentions, and usually their intentions are pure. However, these brilliant problem-solvers have overlooked this most important principle of human motivation. They have failed to create a platform for buy-in by the people who must implement the solution and solve the problem. Remember: Everyone connected with solving the problem you have identified must feel connected to the solution. All must buy in and feel it is theirs.